Companies operating in the Food & Beverage sector have to face a more and more competitive market and are required to offer a constantly diversified range of products, in order to meet the consumer's disparate exigencies. Therefore, the solutions implemented by packaging machine manufacturers are expected to be innovative, cost-effective, efficient, sustainable and able to realize appealing packages. Smiflexi wrap-around packers of the WP series can pack bottles and cans in cardboard boxes, called Fridge Packs, specifically designed to fit into the limited space offered by fridge compartments. Thanks to an innovative design, a pre-scored breakaway panel allows the consumer to conveniently take out of the package just the bottle or can he actually needs. 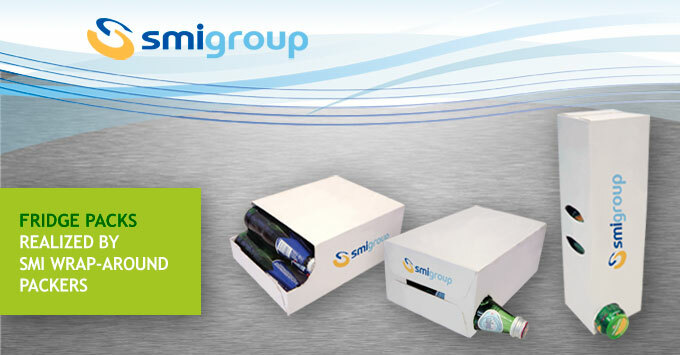 The box thus becomes a dispenser of the products included in the packs. For this kind of packs, it is important to use Kraft paper, which ensures a solid packaging, despite its reduced thickness. The polish, white surface of kraft paper is an optimal solution, ensuring excellent printability and appealing graphics, in order to draw the customer's attention on the products displayed on the shelves at the sales outlets. Smiflexi wrap-around packers of the WP series are very flexible machines, able to meet multiple exigencies: they can pack different types of products (glass, PET, cans, etc.) in different kinds of containers, of large or small size: kraft-paper boxes, microwave or corrugated cardboard boxes. For further information about Smiflexi product range, you can contact our sales department or visit our web site www.smigroup.it.